There are many fun accessories for the iPhone to give it help with photography. You can clip on lenses, add a case that protects the iPhone in all weather or clip on a edge so the iPhone can mount to a tripod. The KLYP package makes all of that look like entry level options. When looking over the KLYP options, you may ask yourself if it would be easier to just carry a regular digital camera that has much of this built in. 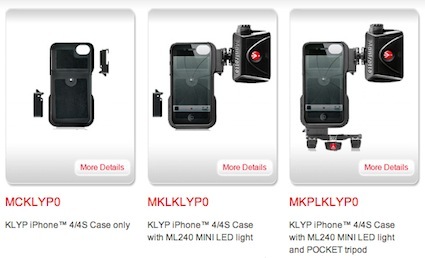 If you prefer using your trusty iPhone 4/4s, then these accessories will put the iPhone over the edge into the land of enhancements for noticeably better shots. 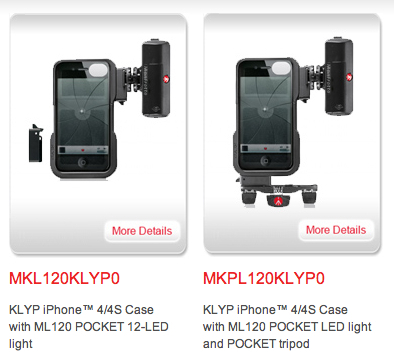 KLYP offers a case that has two mounting areas: one for a tripod and one for a light attachment. The tripod isn’t included in the packages so you have to add that one or use the one you already have. The lighting isn’t a flash, rather a high power LED group that comes in a variety of sizes (available separately or with the package). Do you ‘need’ this set up? Most likely it is way more than the average snapshot needs. But, if your doing close ups or video, these should make a marked improvement. 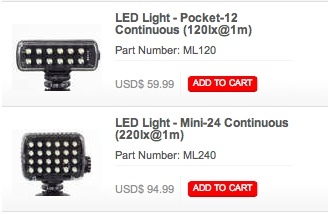 Price wise though, the parts add up pretty quickly… as does any professional camera equipment.